I found my thoughts this week returning to Hyman Minsky, financial evolution and Capitalism. Updating my 2013 Government Finance Quasi-Capitalism thesis seemed overdue. “Minsky saw the evolution Capitalist finance as having developed in four stages: Commercial Capitalism, Finance Capitalism, Managerial Capitalism and Money Manager Capitalism. 'These stages are related to what is financed and who does the proximate financing – the structure of relations among businesses, households, the government and finance'…"
Late in life (1993) Minsky wrote: “Today’s financial structure is more akin to Keynes’ characterization of the financial arrangements of advanced capitalism as a casino.” More and more concerned by the proclivity of “Money Manager Capitalism” to foment instability and crises prior to his death in 1996, Minsky would have been absolutely appalled by the late-nineties “Asian Tiger” collapse, the Russia implosion, LTCM and the “tech” Bubble fiasco. Minsky was no inflationist. His focus would have been to rectify the institutional and policy deficiencies that were responsible for progressively destructive mayhem. Policymakers instead responded to instability and crisis with increasingly activist” (inflationist) measures. In particular, the Fed (and global central bankers) moved aggressively to backstop marketplace liquidity. At the same time, the government-sponsored enterprises (GSEs) began guaranteeing a large percentage of new mortgage Credit, while employing their balance sheets (liabilities enjoying implied federal backing) in similar fashion to central banks, as so-called “buyer of last resort” during periods of market tumult and speculative deleveraging. These government-related liquidity backstops and guarantees fundamentally altered finance. Back in 2001, I updated Minsky’s stages of Capitalistic Development with a new phase, “Financial Arbitrage Capitalism”. Evolving financial, institutional and policymaker frameworks had seemingly mitigated volatility and crisis. Then the 2008 debacle unmasked what had been an unprecedented buildup of risky Credit, problematic risk intermediation processes and the accumulation of leverage and speculative positions. Policymakers and the markets had been oblivious to catastrophic latent liquidity risk inherent to the new institutional structure. “The worst crisis since the Great Depression” provoked extraordinary policy measures. In 2013, after witnessing previously unimaginable central bank interest-rate manipulation, monetization and the specific policy objective of inflating securities markets, I was compelled to again update Minsky’s stages: “Government Finance Quasi-Capitalism”. As finance has a proclivity of doing, “Money Market Capitalism” evolved over time to become increasingly unstable. Policy responses then nurtured a freakish financial backstop that greatly incentivized leveraged speculation throughout the securities and derivatives markets. This process fundamentally loosened financial conditions and spurred risk-taking and spending. After attaining significant momentum in the nineties, the progressively riskier phase of “Financial Arbitrage Capitalism” reached its zenith with the issuance of $1.0 TN of subprime CDOs is 2006/07. The policy response to the 2008/2009 crisis was nothing short of phenomenal. A Trillion of QE from the Fed, zero rates and massive bailouts. Still, the Fed at the time claimed to be committed to returning to the previous policy regime as soon as practical. The Fed devoted significant resources toward mapping out a return to normalcy, going so far as releasing in 2011 a detailed “exit strategy” for normalizing rates and returning its balance sheet to pre-crisis levels. But with the European crisis at the brink of turning global back in 2012, it had become clear by that point that thoughts of returning to so-called “normalcy” were illusionary. It may have been the ECB’s Draghi talking “whatever it takes,” but he was speaking for global central bankers everywhere. QE was no longer just a crisis measure. It would effortlessly provide unlimited ammo for which to inflate securities markets and spur risk-taking and economic activity. If zero rates were not providing the expected market response, no reason not to go negative. If buying sovereign bonds wasn’t getting the job done, move on to corporates and equities. Such a deviant policy backdrop coupled with an already deeply distorted and speculative market environment ensured descent into a truly freakish financial landscape. Most obvious, markets have come to largely disregard risk. Serious cracks in China and Europe have been largely ignored by global markets. The increasingly alarming geopolitical backdrop is completely disregarded. Brexit was regarded - for about a trading session. Global economic vulnerability is on full display, though massive QE and negative-yielding developed country sovereign debt ensures a “money” deluge into the corporate debt marketplace. Concern for risk has hurt performance. Recurring bouts of concern puts one’s career at risk – whether one is a portfolio manager, financial advisor, trader, independent investor, analyst or strategist. The financial and institutional arrangements that I collectively refer to as “Government Finance Quasi-Capitalism” have over time had profound impacts on the securities markets. Policymakers have largely removed volatility from equities (VIX ends the week at 11.39) and fixed income. U.S. corporate debt issuance remains at near-record pace. Stock prices are at all-time highs in the U.S. and elevated around the world. Bond prices are near records almost everywhere. Risk premiums in general have collapsed. Why then is unease so prevalent throughout the securities markets? For one, it’s impossible these days to gauge risk. How much are QE and rate policies impacting securities prices? Will global policymaker have the capacity to withdraw from unprecedented measures, or have they become trapped in disproportionate stimulus with no way out? How big is the downside? How will the future policy backdrop play out? The truth is that no one – certainly not the policymaker community – has any idea what the future holds for policy or the markets. A turn back in the direction of reasonableness and “normalcy” or a further spiral out of control? There’s a strong argument that investing has been largely relegated to a thing of the past. If risk is completely unclear, it’s impossible to gauge risk versus reward. Furthermore, how are company fundamentals (i.e. earnings, cash-flow, etc.) impacted by massive monetary and fiscal stimulus? How about the macro economy? And if risk vs. reward is unknowable and valuation metrics so obscured, it’s delusional to refer to “investment”. A defining feature of Government Finance Quasi-Capitalism is that speculation now completely dominates investment. An unintended consequence of policymakers suppressing volatility and masking risk is that active management has been severely disadvantaged relative to passive management. Traditional investment analysis and risk management have been a significant detriment to performance. Why bother, when fees are lower with passive anyway? So “money” has flooded into ETFs and other index products simply to speculate on “the market.” Passive management really couldn’t care less about China, European banks, Brexit, Japan, Bubbles or policymaking more generally. Trillions of liquidity injections coupled with volatility suppression has ensured that Trillions have flooded into dividend-paying stocks, “low beta,” “smart beta” and other perceived low-risk equity market strategies. 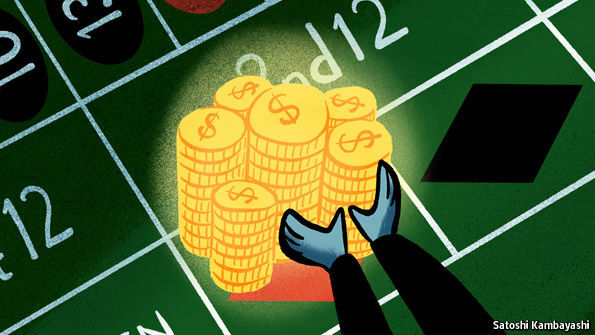 Government Finance Quasi-Capitalism has transformed Trillions of risk assets into perceived “money-like” instruments, throughout the securities markets and surely in derivatives. These massive flows into perceived safety have been instrumental in fueling the entire market to record highs in the face of persistent and growing risks. Previously, Financial Arbitrage Capitalism fomented “money” risk misperceptions and resulting liquidity crisis vulnerability in the “repo” market. Similar risks continue to mount in the Government Finance Quasi-Capitalism period throughout perceived low-risk equities, fixed income, corporate debt more generally and higher-yielding assets throughout the overall economy (i.e. commercial real estate). U.S. household Net Worth is at record highs, while the ratio of Net Worth to GDP is near all-time highs. It’s worth noting that U.S. unemployment at 4.9% is outdone by China’s 4.1% and Japan’s 3.1%. Why then is there such social tension and geopolitical unease? The Financial Arbitrage Capitalism period was notable for a momentous misallocation of real and financial resources. The economic structure suffered mightily, clearly evidenced by deteriorating productivity associated with deep structural deficiencies, along with underlying economic fragility. I would strongly argue that the ongoing Government Finance Quasi-Capitalism phase, with a massive inflation of government debt and only more grotesquely distorted markets, is even more dysfunctional at creating and distributing real economic wealth. Thus far it has succeeded in inflating perceived financial wealth, although this has only exacerbated the social and political problems associated with blatant wealth inequities. Government Finance Quasi-Capitalism creates essentially unlimited demand for perceived low-risk corporate Credit (think Apple, Microsoft, Verizon, etc. ), creating myriad market, financial and economic distortions. For one, it feeds financial engineering, including stock-repurchases and M&A. This dynamic exacerbates the big firm advantage and monopoly power more generally, at the expense of economic efficiency. I would contend it also is an increasingly important aspect of wealth inequality: the few really big get bigger and more powerful at the expense of everyone else. Financial flows are siphoned away from the general economy to be flooded into the hot sectors. A handful of cities – think SF, Seattle, Portland, Austin, L.A., and New York – lavish in prosperity while small town America is left to rot. I have asserted that Bubbles only redistribute and destroy wealth. I have further posited that geopolitical instability is a dangerous consequence of the global government finance Bubble. Both China and Japan are in the midst of respective precarious Bubble Dynamics. It’s no coincidence that animosities and geopolitical risks between the Chinese and Japanese are rapidly escalating. Tensions between Russia and the West have close ties to the global Bubble. Turkey’s problems are exacerbated by its bursting Bubble. The Middle East, Latin America and Asia are all suffering from Bubble consequences. Brexit was Bubble fallout. I am most nervous because I see no dialing back Government Finance Quasi-Capitalism. Government intervention – in the U.S., Europe, Japan, China and EM – has been so egregious and overpowering that retreat has become unthinkable. Policymakers would have to admit to historic misjudgment – and then be willing to accept the consequences of reversing course. Bursting Bubbles will evoke finger-pointing and villainization. That’s when the geopolitical backdrop turns frightening. This week, the Bank of England (BOE) surprised the markets with a move to even more aggressive monetary stimulus. Global central bankers these days all play from similar playbooks, although when presented with the opportunity each takes their whirl at experimentation. Bank of England Governor Mark Carney’s announcement that the BOE would commence corporate bond purchases solidified the market view that global central bankers will increasingly look to corporate debt for QE fodder. The BOE also announced a new lending facility, hoping to entice banks into lending more aggressively. Minsky’s phases of capitalistic evolution were U.S.-focused. It’s disturbing that Government Finance Quasi-Capitalism has evolved into such powerful global phenomenon. This ensures market fragilities and economic maladjustment on a globalized and highly correlated basis. Thus far, global central bankers have maintained a rather consistent and concerted approach. Central banks seem to collectively recognize that they are together trapped in the same dynamic. This has encouraged cooperation and coordination. At some point, however, zero-sum game dynamics will prevail. I’ve briefly touched upon the misallocation of real and financial resources, along with attendant social, political and geopolitical risks associated with economic stagnation and gross wealth inequalities. One can these days see the “third world” as increasingly chaotic. One can as well see EM regressing toward more “third world” tendencies. And in the developed U.S. and Europe, in particular, one can witness more EM-like tendencies of wealth inequality, polarized societies, corruption and political instability. There’s another key facet of Government Finance Quasi-Capitalism: A troubled global banking sector. Sinking stock prices seem to confirm that banks are a big loser, as governments impose command over financial relationships and economic structure. This is a complex subject. I would argue that governments have placed banking institutions in a difficult – perhaps dire - predicament. In general, banks have become increasingly vulnerable to mounting financial and economic vulnerability. Highly leveraged banking systems from the UK to China will have no alternative than to lend, no matter the degree of policy-induced financial and economic instability. And the more government policies inflate asset prices (including U.S. housing), the more these assets Bubbles will depend on ongoing bank lending support. Moreover, keep in mind that banking systems have been delegated the task of intermediating central bank Credit (largely) into bank deposits. Central bank issued Credit (IOUs) ends up chiefly on commercial bank balance sheets, banks having accepted central bank funds in exchange for new bank deposit “money”. So in this high-risk backdrop of government-induced market distortions, banks are building increasingly risky loan books (and “investment” portfolios) while sitting on specious (and inflating) holdings of central bank and government obligations. And this high-risk structure works only so long as Credit – central bank, government and financial sector – continues to expand. Government Finance Quasi-Capitalism really amounts to a Hyman Minsky “Ponzi Finance” dynamic on an unprecedented global scale. Worse yet, the greatest impairment unfolds right in the heart of contemporary “money” and Credit. It’s worth noting that despite Friday’s 4.9% surge Italian Bank Stocks sank 6.2% this week (down 51% y-t-d). Japan’s TOPIX Bank Index dropped 3.1% (down 32% y-t-d). Japanese 10-year JGB yields jumped 10 bps to a three-month high negative 10 bps. Ten-year Treasury yields rose 14 bps this week. There’s an increasingly unpredictable element to the U.S. Bubble Economy that should keep the Federal Reserve and the bond market uneasy. Currency market instability persists. The pound remains vulnerable, while the yen is curiously resilient. EM is a mystery wrapped inside an enigma. And if bond yields begin to surprise on the upside, a whole lot of “money” is going to be positioned on the wrong side of an extremely Crowded Trade. The Morgan Stanley macroeconomist sees more woes ahead for China and Russia. The U.S., India, and Germany will prosper. World events seem to have spiraled out of control this summer, especially in the developed world of the U.S. and Europe. Against all predictions, United Kingdom citizens voted to leave the European Union, calling into question the very future of this noble experiment in transnational governance. Islamic terrorists have made abattoirs of disparate locations, from Orlando, Fla., and Istanbul to Paris; Ansbach, Germany; and Nice, France. Racial strife has flared in U.S. cities, and police have been targeted in Baton Rouge, La., and Dallas. In the view of Morgan Stanley macroeconomist Ruchir Sharma, at least some of these baleful developments, most notably Brexit, have their roots in the painfully slow global recovery from the 2008 financial crisis that wreaked such damage on world economic growth. For one thing, the recovery triggered growing income and wealth inequality within societies, as central banks, led by the Federal Reserve, have engaged in unprecedented loose monetary policies in an attempt to juice economic growth. The unintended consequence of these policies saw the rich benefit mightily as financial asset prices rose while the wages for the vast majority of the citizenry remained largely stagnant. And though it’s somewhat beyond his purview, Sharma thinks the civil disobedience and racial strife afoot in the U.S. can be explained, in part, by the antiestablishment sentiment that “is sweeping the world and lapping up on America’s shores.” The rising tide of antiglobalization and growing inequality of wealth have also added to the tensions in U.S. cities and elsewhere. 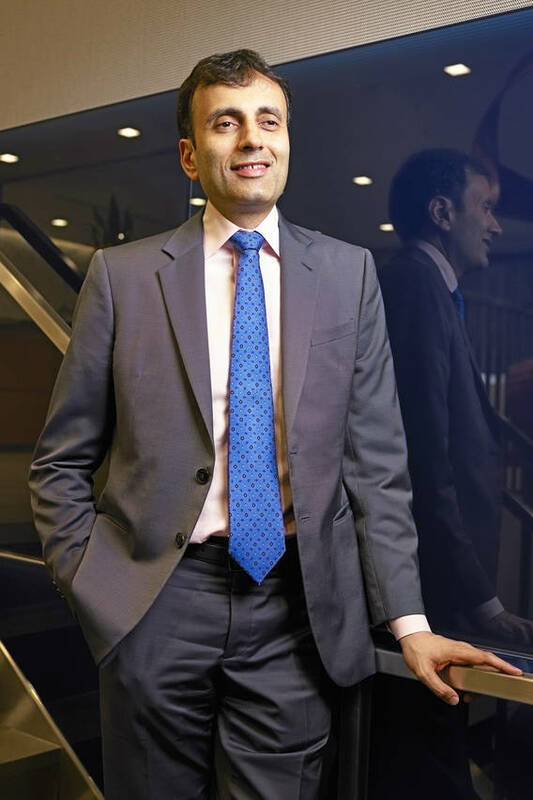 THE 42-YEAR-OLD SHARMA has spent the past 20 years with Morgan Stanley Investment Management, beginning as an analyst in Mumbai. He was raised in Delhi, the son of a military officer, and had been writing a newspaper column for India’s largest financial daily, the Economic Times, since age 17. Today, he’s the firm’s chief global strategist and heads its emerging markets equity team. As such, he travels the world, averaging one week out of each month visiting developed and developing countries alike, talking to folks ranging from heads of state and central bankers to business leaders and people on the street. “You’d be surprised how much you can learn, from mall visits to barnstorming around the countryside, about what’s going on,” he avers. Sharma and his team of 25 analysts, economists, portfolio managers, and other professionals also pore over all manner of economic statistics and government reports to get a bead on the latest trends. The unit, a pioneer in emerging market investing, runs some $20 billion in assets. “I purposely keep my forecast periods short, five years max, because there’s too much that can happen beyond that, in terms of technological and secular changes, to make longer predictions reliable,” he says. He labels the megatrends that he sees at play “the four ‘Ds’ ”: depopulation, deglobalization, deleveraging, and de-democratization. Depopulation, he explains, is a reflection of the decline in the working-age population in developed regions including Western Europe, Japan, Taiwan, and Korea. It likewise is affecting the world’s second-largest economy, China, which passed that fateful milestone last year. And while the U.S. is on the path to a shrinking workforce, immigration may well keep that wolf at the door for at least the next decade. More often than not, a 1% drop in the labor force lops off 1% in economic output, Sharma points out, and boosts in productivity—output per man hour—have been limp of late in the U.S. and elsewhere. He also sees a worrisome trend toward what he labels deglobalization. Since the 2008 crisis, world trade has trailed as a percentage of economic growth, and international capital flows have plummeted, largely because international banks have pulled back lending to within their home borders. Trade has also suffered from a recrudescence of protectionism in the form of competitive currency devaluations and the erection of stealth trade barriers to counter alleged malefactions by competitors, such as goods-dumping and unfair subsidization of exports. Trump has made a centerpiece of his presidential campaign the alteration of various U.S. trade agreements that he claims have shipped U.S manufacturing jobs overseas. Even Hillary Clinton, the Democratic nominee for president, has withdrawn her support for the Trans-Pacific Partnership, a pact with 11 other Pacific Rim countries, the passage of which was once considered a slam-dunk. The third “D”—the necessity for countries to deleverage—also could mute gains in gross domestic product. Sharma cites a McKinsey study showing that global debt at the end of 2007 was actually $57 trillion above its already-engorged level of $142 trillion on the cusp of the credit crisis. Of perhaps greater moment, at the end of 2014, the ratio of total global debt to GDP stood at 286%. That’s 17 percentage points higher than it was at the onset of the 2008 crisis—after seven years of economic recovery. His final “D,” de-democratization, has also impaired the recovery. In many countries, populaces have embraced autocratic leaders promising to relieve economic distress through decisive executive actions. “Such unchecked meddling often destroys investor and business confidence, and delivers less-healthy economic growth in the long term,” says Sharma. IT ISN’T BY CHANCE, he claims, that a survey by watchdog group Freedom House shows that, over the past decade, the number of nations showing a decline in political and human rights exceeds those that have seen an increase. “This is largely the result of regimes trying to force-feed enhanced economic growth,” he explains. Yet Sharma isn’t unduly pessimistic. He merely believes that economic growth expectations have to be tempered somewhat to accommodate the new reality of a post-boom world. He thinks that developing nations, for example, should be content with 4%-to-5% annual GDP growth, rather than, say, 7%. The new target for wealthy developed countries like the U.S. should be 1.5%, rather than more than 3%. To rate the near-term prospects of different countries, he uses various measures of his own confection that are based on both his globe-trotting experience and deep-dive studies capturing the influence of a host of factors on national economic growth. Demographic trends in working-age populations tend to be fairly straightforward. But he leavens that with adjustments for worker-participation rates, the percentage of women in the labor pool, openness to immigration, and freedom of opportunity. The U.S. gets high marks here despite all of the controversy currently surrounding immigration reform. Sharma points to the fact that 30% of the workers in Silicon Valley are foreign-born. Of the top 25 U.S. tech companies, as of 2013, 60% were founded by first- or second-generation immigrants, including Steve Jobs of Apple, Sergey Brin of Google, and Larry Ellison of Oracle. Sharma also puts much stock in combing billionaire lists of different countries to gain insight into the vulnerability of different societies to populist unrest triggered by resentment over wealth inequality. He looks at how much of that wealth was inherited or achieved through other than honest means. In the past five years, he notes, the wealth of U.S. billionaires as a share of GDP has risen to 15% from 11%. But that doesn’t tell the entire story. Most of the U.S. plutocrats are what Sharma calls “good billionaires,” that is, self-made men and women who created their wealth by developing unique products and services that boosted jobs and economic growth. Obviously, political leadership matters mightily to the economic fortunes of countries. Even many reformers who come to office after an economic crisis typically turn “stale” after a term or so in office. Surrounded by sycophants and toadies, they tend to become more dictatorial and rapacious with the passage of time. Prime examples of this are Russia’s Vladimir Putin and Turkey’s Recep Tayyip Erdogan, who took office near the turn of the millennium during financial crises in their respective countries. Both succeeded at reforming antiquated tax systems and cutting fiscal excesses to right their economies. But soon, both leaders morphed into full-blown autocrats seizing ever more levers of power, abridging civil liberties and stamping out free expression. Erdogan’s mass arrests of thousands in the wake of the recent failed military coup is merely of a piece with his long-running campaign of suppression of political opposition and stamping out of a free press. ANOTHER OF SHARMA’S important markers is the aforementioned national debt-to-GDP ratio. His study of historic debt binges indicates that when the five-year increase in the private debt to GDP ratio exceeds 40 percentage points, that nation is headed for a severe economic slowdown and, in many cases, a severe credit crisis. China, which he says has gone on the biggest debt binge in human history, has seen its debt to GDP ratio increase by 80 percentage points in the five years following its pedal-to-the-metal stimulus program to counter the effects of the 2008 global crisis. Of course, of paramount importance is how nations, in particular developing ones, invest their savings and foreign direct investment. Sharma argues that economic growth is best fostered by investment in manufacturing, with an eye toward moving up the export value chain by going from shoes and textiles to, eventually, cars and electronic goods. Manufacturing, if done right, creates an affluent middle class to build a consumer culture around. It also spurs innovation and leads to a buildout of infrastructure, such as roads, bridges, rail lines, ports, and power grids. He sees such countries as Mexico, India, Vietnam, Bangladesh, and Kenya moving smartly up this development escalator. A strong manufacturing sector also serves to protect economies from much of the volatility of global economic cycles. That, of course, isn’t the case with economies reliant on what they can garner from exporting oil, natural resources, and other commodities. The price swings in these markets are vicious, leading to gross overspending by countries in good times “that they think will go forever,” followed by economic despond during the inevitable commodity bear markets. Russia, Brazil, Saudi Arabia, Nigeria, South Africa, and even Australia and Canada are currently caught in this commodity black hole. SHARMA ALSO KEEPS CLOSE WATCH OVER what he considers unhealthy investment binges in real estate and national stock markets. China, these days, is the poster child for such speculative excess, and that is an important signal of coming problems. Academic studies show that nearly two-thirds of recent serious recessions around the globe followed on the heels of busts in national real estate or stocks. “These binges leave little in the way of productive assets behind for future growth,” Sharma opines. Media hype of different national economic prospects can also prove problematic for rating economies. The press usually follows the conventional wisdom of economists and experts at the World Bank and elsewhere, who typically miss key turning points. One can point to all sorts of busted media themes since the turn of the millennium. 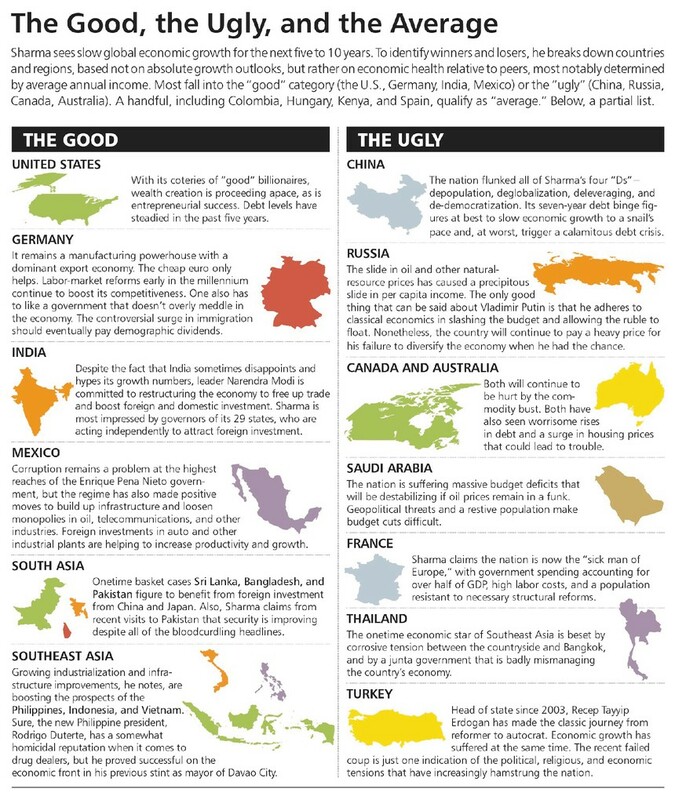 Among them: predicting the convergence of incomes between rich and developing nations and the inevitable rise of China to economic predominance in this century. “I prefer to look closely at countries that are so disdained by media that they are virtually ignored,” he explains. Argentina fits his bill. After 14 years of Peronist misrule and economic mismanagement, the new president, technocrat Mauricio Macri, is making long-needed moves to tame hyperinflation, bring about budgetary order, boost investment in infrastructure, and settle nagging international debt disputes. Sharma also scrutinizes capital flows in and out of countries to glean important shifts in national economic growth. He believes in “following the local money,” because local businessmen and investors tend to have a more granular, nuanced view of what’s going on in their own economy than do international lenders and foreign investors who are usually last to get the memo. That’s what makes recent bouts of capital flight in China so worrisome. The current economic problems in Russia were anticipated by a heavy flow of oligarch money out of Russia as long as two years before the oil market crash last year. Macroeconomics is an unforgiving field in which even seasoned veterans like Sharma can get fooled. He admits to have been somewhat blindsided by the 1997 Asian financial crisis, which began in Thailand, and also by the speed of the recovery two years later, after the region’s currency values steadied and economic growth resumed. Sharma has rueful memories of a large bank conference he addressed in Moscow in October 2010, in which he predicted serious economic troubles ahead for the nation because of Putin’s failure to diversify its natural-resources-based economy. The problem was that a poker-faced Putin was sitting on the dais as Sharma spoke, along with then French Minister of Finance Christine Lagarde, who kept shooting Sharma shocked sideways glances. Sharma was savaged in the state-controlled press the following day as an ingrate from Wall Street, whose money Russia emphatically didn’t need. Yet, speaking and writing truth to power is part of Sharma’s remit. That’s one of the aspects of his job that makes it interesting. Is America Facing a Police Crisis? Citizen confidence in the police at its lowest point in 20 years. It has dropped among Americans of all ages, education levels, incomes and races. Ronald Reagan famously stated, “The nine most terrifying words in the English language are: I’m from the government and I’m here to help.” But should we apply such thinking to the police? The answer depends on whom we ask. Many liberals who otherwise defend every government program and unionized job believe that the police are increasingly abusing their power. Many conservatives who otherwise complain about unaccountable government officials consider the police department beyond reproach and say that any form of de-policing will make America less safe. Crime has decreased significantly in the past two decades, and many attribute that outcome to the proactive “broken windows” policing first advocated by James Q. Wilson and George L. Kelling in a 1982 article. The theory goes that arresting offenders for minor crimes like loitering or drinking in public leads to a mien of order that in turn discourages major crimes. Citizens will be better off with, and thus prefer, police playing an active role in the community. Surveys today, though, show citizen confidence in the police at its lowest point in 20 years. It has dropped among Americans of all ages, education levels, incomes and races, with the decreases particularly pronounced among the young and minorities. According to a USA Today/Pew Research Center poll, only 30% of African-Americans say that they have a great deal or quite a lot of confidence in the police, and nine out of 10 say that the “police do an ‘only fair’ or poor job when it comes to equal treatment and appropriate force.” Nine out of 10 Americans surveyed say that officers should be required to wear body cameras to check police violence. The past month has seen extraordinary killings, both by police officers and of police officers, in St. Paul, Baton Rouge and Dallas. 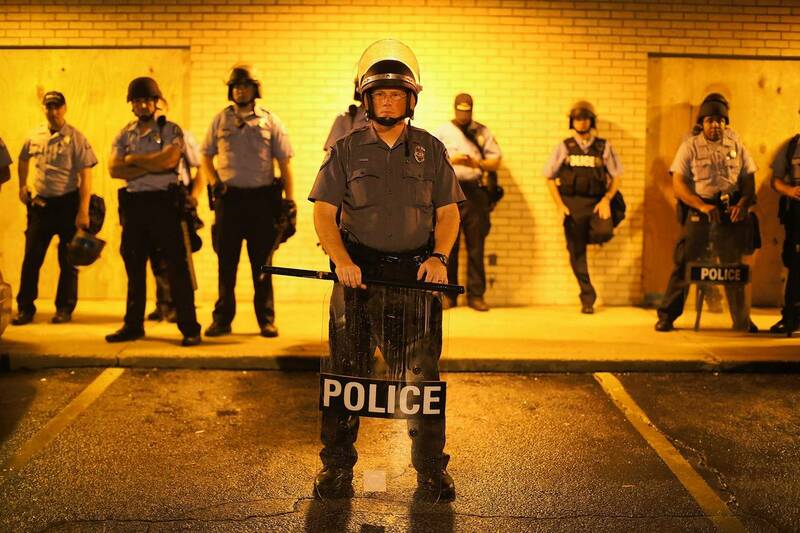 All across the political spectrum, people agree that American policing is in turmoil. But different groups emphasize different aspects of the crisis. Where Black Lives Matter protesters emphasize the danger of being killed by the police, Blue Lives Matter counter-protesters emphasize the risks faced by hard-working policemen. The issues are so polarizing as to leave little room for considered thought or discussion. As an economist, I’d like to advocate taking a step back and looking at the data to begin to gain some perspective. In 2015, 41 officers were slain in the line of duty. That means the 900,000 U.S. law-enforcement officers face a victimization rate of 4.6 deaths per 100,000 officers. Any number greater than zero is a tragedy, but the average American faces a nearly identical homicide rate of 4.5 per 100,000, and the average male actually faces a homicide rate of 6.6 per 100,000. Being a police officer is thus dangerous but not as dangerous as being an average American male. In the same year, police killed 1,207 Americans, or 134 Americans per 100,000 officers, a rate 30 times the homicide rate overall. Police represent about 1 out of 360 members of the population, but commit 1 out of 12 of all killings in the United States. Many argue that these are justifiable, but are they necessary? In England and Germany, where the police represent a similar percentage of the population as in the U.S., they commit less than one-half of 1% of all killings. Are higher rates of violence inevitable in our country with its more heavily armed populace, or can things be done to reduce the growing tensions? Former policeman Norm Stamper’s book “To Protect and Serve: How to Fix America’s Police” provides a first-hand account of the changes in policing over the past few decades and is a useful survey of how we got here. He started as a beat cop in San Diego in 1966 and rose to be chief of police in Seattle from 1994 to 2000. He witnessed both the more discretionary eras of policing and the advent of broken windows policing, which was first adopted in New York City in the 1990s and evolved into an aggressive form of proactive and “zero-tolerance” law enforcement that spread across the nation. Mr. Stamper joined the force out of a desire to serve the community but quickly learned that his performance would be judged on the number of tickets he wrote and arrests he made. An experienced officer told him, “You can’t let compassion for others get in the way.” There were quotas to fill. “The people on my beat were, in a word, irrelevant,” Mr. Stamper writes. The war on drugs was declared in 1971—then escalated in the 1980s—and Mr. Stamper noticed police increasingly treating civilians like enemy combatants. In 1994, President Clinton passed the largest crime bill in history. It allocated $8.8 billion to hire 100,000 more police officers and $10 billion for new prisons, and it established mandatory arrests for allegations like domestic violence and mandatory life sentences for third-time drug or violent offenders—the three-strikes provision. Incarceration rates spiked nationally. The rate at which the government incarcerates Americans is now seven times what it was in 1965. “To Protect and Serve” is particularly disturbing in showing that, as antagonism toward and disregard for the public increased among policemen, it had few consequences. Officers do not report on their colleagues, and prosecutors are averse to punishing people with whom they must work closely. Mr. Stamper quotes a fellow police chief saying: “As someone who spent 35 years wearing a police uniform, I’ve come to believe that hundreds of thousands of law-enforcement officers commit perjury every year testifying.” Instead of policemen serving the public, Mr. Stamper concludes, they end up viewing citizens as numbers or revenue sources. One important lesson from economics is that unaccountable government officials will not always act on the public’s behalf. Another account of modern policing is “A Good Month for Murder: The Inside Story of a Homicide Squad” by Del Quentin Wilber, a newspaper reporter who spent a month alongside detectives in one of the Maryland suburbs of Washington, D.C. This attempt at a true-crime drama seems to have been meant in praise of police work, but Mr. Wilber unintentionally creates an unflattering picture. He shows us men who refer to their targets as “reptilian motherf—ers” and conduct multi-hour interrogations in the middle of the night to elicit confessions. They throw chairs against walls to intimidate suspects, lie boldly during interrogations and happily feed lines to witnesses to use in court. One detective “jokes with [another] that he could get [a suspect] to confess to anything: ‘Have any open murders that need to be closed?’ ” The Fourth Amendment to the Constitution attempts to restrict search and seizure without probable cause, but judges here grant warrants without a thought: “He just immediately signed the paper and looked at me and winked and said, ‘Good luck.’ ” At one point, a supervisor explains that a prisoner cannot be questioned about earlier crimes without having a lawyer present. The detective retorts: “F—ing Constitution.” In the end, the policemen excuse any mistakes they made by saying they had good intentions. The Ferguson police department evaluated officers and gave promotions based on “citation productivity,” and prosecutors and judges worked alongside them to collect revenue. In a city with 21,000 residents, the courts issued 9,000 arrest warrants in 2013 for such minor violations as parking and traffic tickets or housing-code violations like having an overgrown lawn. When the Ferguson citizenry started mass protests against police abuses last year, they were met with the equivalent of a standing army. The news photographs of police in camouflage, body armor and helmets working in military formation with guns drawn were a wake-up call for many Americans, who wondered just how the police came be so militarized. It was all part of the spread of zero-tolerance policing in the 1990s. The question is just what would happen if law enforcement toned down its zero-tolerance policies? Much of the book is focused on the post-Ferguson state of policing, but it also includes some of her warnings and predictions from recent years. In a chapter drawn from a 2013 article, for instance, Ms. Mac Donald worries that in the first full year after the court-mandated 30% decrease in California’s prison population, the state’s “crime rate climbed considerably over the national average.” And in one from 2014 she writes that the 2013 ruling that led to the elimination of “stop-and-frisk” tactics in New York has set in motion “a spike in violence.” Yet between 2008 and 2014, homicides fell by 21% in California and 34% in New York; crime in other categories was down, too. In the very year when Ms. Mac Donald suggests crime rates were climbing in California, homicide rates fell 7%. This was equally true for New York City after stop and frisk was outlawed; homicide rates were ultimately down 0.5% in 2014. It appears that keeping those extra 46,000 Californians behind bars or subjecting New Yorkers to 4.4 million warrantless searches between 2004 and 2013 was unnecessary for public safety. More recently, Ms. Mac Donald has warned about a “Ferguson effect” that has led to a “rise in homicides and shootings in the nation’s 50 largest cities.” Starting in the summer of 2014, anti-police-violence protests have prompted large reductions in aggressive policing, and Ms. Mac Donald points to increases in crime in cities including Baltimore, Minneapolis, Milwaukee and Nashville. She states that we are now seeing a “surge in lawlessness” and a “nationwide crime wave.” The latest FBI data, however, compares the first six months of 2014 and 2015 and shows that violent and property crime have both decreased in dozens of large cities, including Cleveland, Detroit, Houston, New York and Philadelphia. From 2014 to 2015, violent crime did increase by 1.7% nationwide, but property crime decreased by 4.2%. Any data series will have some fluctuation, and even with a sustained downward trend upticks are likely. The homicide rate, for example, has seen rises in four of the past 15 years but has fallen by 18% over the same period. To put the 1.7% “surge in lawlessness” into perspective, 2012 saw a 1.9% increase in violent crime and a 1.5% increase in property crime when zero-tolerance policing was still the norm nationwide. And such a modest increase from one of the safest years in decades did nothing to change the fact that crime remained—and remains—close to a record national low. Ms. Mac Donald is not alone in her thinking. Gallup does an annual survey asking, “Is there more crime in your area than there was a year ago, or less?” In 14 of the past 15 years, the majority of Americans felt that crime had increased. But answering empirical questions requires looking at the numbers. A data-driven book that does not engage in alarmism is “The Rise and Fall of Violent Crime in America” by Barry Latzer, a professor at the John Jay College of Criminal Justice. The long-term trends in violent crime he presents are telling: In 1900, the American homicide rate was 6 per 100,000 people. During Prohibition, it increased to 9 per 100,000 but fell to 4.5 per 100,000 by the 1950s. From the late 1960s and into the 1970s, the homicide rate spiked, reaching 11 per 100,000. In the late 1970s, it started falling, increasing slightly in the late 1980s but steadily decreasing since the 1990s to the current level of 4.5 per 100,000, among the lowest in the nation’s history. Should one attribute the decrease in crime to zero-tolerance policing and mass incarceration? It turns out that homicide rates in Canada start at a lower level but track the changes in American homicide rates almost exactly. In the past 25 years, our northern neighbor experienced equal declines in all major crime categories despite never having ramped up its policing or incarceration rates. Those attributing all decreases in crime to increases in American law enforcement are looking in the wrong place. As Mr. Latzer carefully says, “the jury is still out”: Violent crime rates “fell off all over the nation without any clear relationship between the enormous declines in some cities and the adoption of new policing models.” Even though American and Canadian homicide rates rose in the late 1980s, the long-term downward trend clearly began in the late 1970s and early 1980s. Mr. Latzer concludes that the major determinants of a crime rate are likely cultural factors and economic opportunity. The employed family man is going to be less interested in crime than the unemployed and unattached. A month ago we heard predictions about the world economy’s impending collapse if Britain left the European Union. Yet within a week of the Brexit vote, British stock prices reached 2016 highs, and American stock prices are at an all-time high. We can be sure that we will hear similar warnings in response to proposals for lowering incarceration rates, reducing the number of policemen, de-militarizing police departments or even privatizing much or all of what they do. Yet, as Messrs. Stamper and Latzer point out, professional police departments were only invented a century and a half ago, and in 1865 New York incarcerated fewer than 2,000 citizens at any given time, compared with upward of 80,000 today (48 per 100,000 then versus 265 per 100,000 now). Then, as now, societies were kept safe by numerous factors beyond government-sanctioned law enforcement. These range today from the most informal eyes on the street to the more formal million-plus private security guards currently employed in America. Around New York City, business improvement districts pay for security personnel to do foot patrols, so the relevant policy choice is not between government police or no security whatsoever. My own research has also found a strong negative correlation between homicide rates and economic freedom in a society. Free markets let people put their passions into business to work for others’ benefit. Restrictions on business, including minimum-wage laws that keep young inner-city residents out of the labor force, are particularly harmful. We need more markets, not more government, to discourage crime. One need not assume that unionized, militarized and unpopular policemen are the only option for keeping Americans safe. INVESTORS who need income have traditionally opted for savings accounts and bonds. That was believed to be the safe approach. In the conventional view, equities were what you bought when you wanted long-term capital gains. That view was always short-sighted; over 20-year periods around half of the total return from American shares comes from reinvesting dividends. But ignoring the income-generating appeal of equities looks particularly odd now. 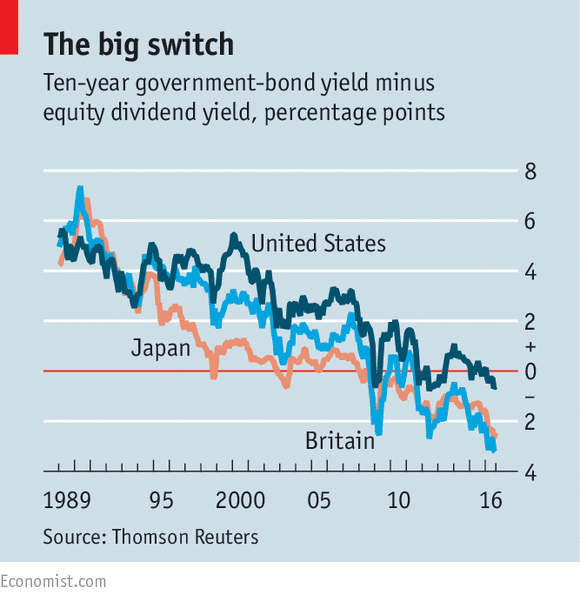 The dividend yield on shares in America, Britain and Japan is higher than the yield on ten-year government bonds; in the case of the latter two, the difference is more than two percentage points (see chart). The gap is nothing like as big in America, although many would argue that share buy-backs materially boost the effective yield. For investors who started their careers in the 1980s and 1990s, this relationship looks very weird. For them, the norm was for bonds to offer a yield many percentage points higher than that from equities. As a result, when, in 2003, the dividend yield on British shares rose above the government-bond yield for a few days, many investors saw it as an historic buying opportunity. London’s FTSE 100 index duly rallied sharply. A closer look at the chart suggests something significant has changed. Equities have frequently yielded more than bonds in both Britain and Japan since 2008, without signalling that shares were a steal. Financial history shows that the valuation basis for equities and bonds has already undergone one historic change. Up until the late 1950s, it was quite common for equities to yield more than government bonds. That is because equities were perceived to be more risky. Companies pay dividends only after they have satisfied the demands of other creditors, in particular bondholders. The Depression had shown that equities could collapse in price and that many companies could go bust. So, the institutional investors of the 1930s and 1940s thought it prudent to place the bulk of their assets in bonds. But from the mid-1950s onwards, these big investors started to change their minds. Memories of the Depression faded. Equities might be individually risky but a diversified portfolio looked much more secure. Over time, the dividend income from shares would rise while the income from bonds was fixed. And as inflation soared in the 1960s and 1970s, that made holding bonds look like a very bad idea. The “cult of the equity” had arrived. In other words, this first valuation shift between bonds and equities was down to a change in economic fundamentals and in the attitudes of institutional investors. Both factors are probably at play in this latest switch, too. Since 2008 the developed world has struggled to generate either inflation or consistently rapid growth. That combination is better for bonds than it is for equities. In a sense equities have defied the odds, rallying strongly since the spring of 2009 despite sluggish economic growth. The reason is that profits (in America in particular) have been high as a proportion of GDP, because wages have been held down. But it seems unlikely that profits can stay elevated indefinitely. And although a diversified portfolio of equities protects investors against the risk of individual company failure, they can still suffer significant losses from a market sell-off. Japan’s Nikkei 225 is less than half its 1989 peak. Dividend income can be slashed in a crisis; it fell by 28% in America in 2008, for example. Investor attitudes have also changed. Regulations mean that insurance companies and pension funds have reduced their exposure to equities and pushed up their bond holdings. They are no longer automatic buyers of equities when the market falls. The cult of the equity has lost some important followers. Central banks have also become huge players in the government-bond markets, pushing yields to negative levels in many cases. That has led some commentators to argue that, rather than equities being cheap, bonds are ridiculously expensive. This view may turn out to be right. But investors have been betting that Japanese bonds are overvalued for more than 20 years in a trade now known as the “widowmaker”. In the post-2008 world, bond yields seem likely to stay low. That should make investors cautious about using bond yields as a buy signal for equities. The income from equities looks very appealing and (in the absence of a recession) should provide support for share prices. But do not count on share prices rising sufficiently to push the dividend yield below bond yields again. 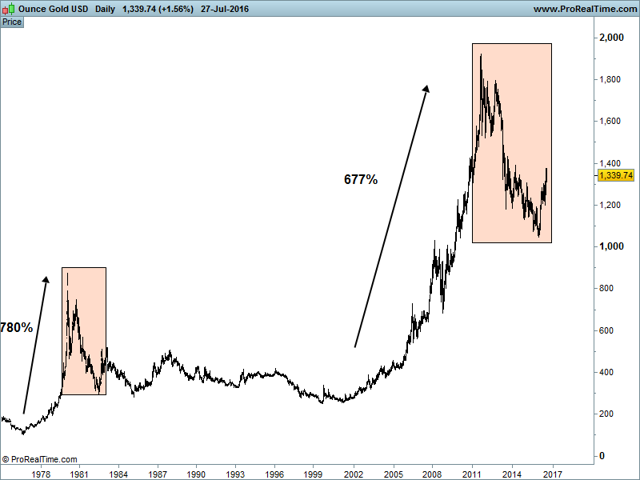 - A detailed look at where gold and silver are in relation to the long-term trend. - A guide for future price action. - Second article in the series providing a complete guide to trends in all asset classes. 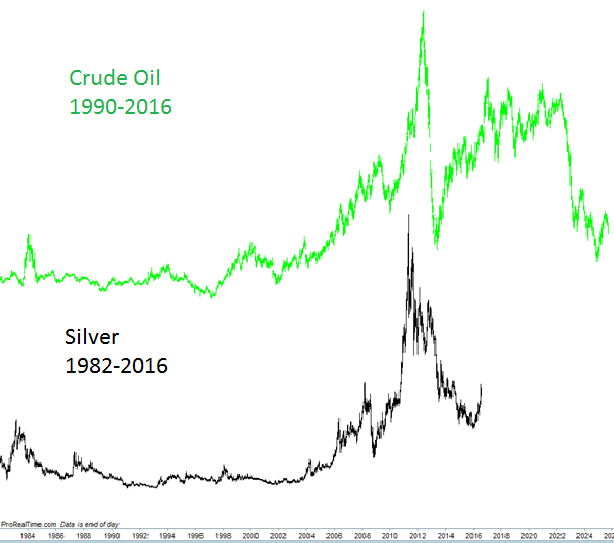 This article will add on to the recently published equity cycles and trends review with a section focusing on commodities. In this update, I will look at the long- to medium-term trends in the precious metals, gold and silver, and will also look at the probable future movements. I will say again, I use Elliott Wave to identify trends, and fractal theory to provide a guide to what future price action may look like. There are hundreds of methods used in trading, but in my opinion, there is no better way of identifying long-term trends. So without further ado. Gold and silver traded into bubble territory in 2011, and this will affect them for a long time to come. As much as the movements of the precious metals are correlated, there are important differences in the cycles which could lead to a disconnect over time. Gold's (NYSEARCA:GLD) decline has not been as severe as many boom and bust cycles (e.g. oil), but the lack of a crash only delays the need to correct. There are further declines to come. The four-year bear market of 2011-2015 completed the first leg down of the correction in wave "A". This was a nearly perfect "impulsive" wave. Wave 1 and wave 5 were equal in size at around $390, plus wave 3 was the strongest, longest and was very near 161.8* wave 1. These are perfect ratios contained in a trend channel which was broken strongly when the trend completed. We are now in wave "B". The big question is, what will wave "B" look like? All we really know is that it can't go higher than the 2011 highs, and it will eventually reverse into another decline for wave C; a classic ABC correction. This is the long-term framework, but we need more accuracy than that. We can look at the smaller time frames, but they are not always reliable, and I prefer to first look at historical precedence. Has gold ever been in a similar situation before, and what happened? Gold has indeed been in bubble territory before with a +790% rally in four years from 1976 to 1980. The reaction to this rally has many similar traits to the more recent reaction in 2011-2015. The above chart suggests wave "B" could be a long, protracted affair and a re-test of the lows is likely. This fits with post bubble price action; new trends take a long, long time to develop, and moves in both directions will likely be faded. 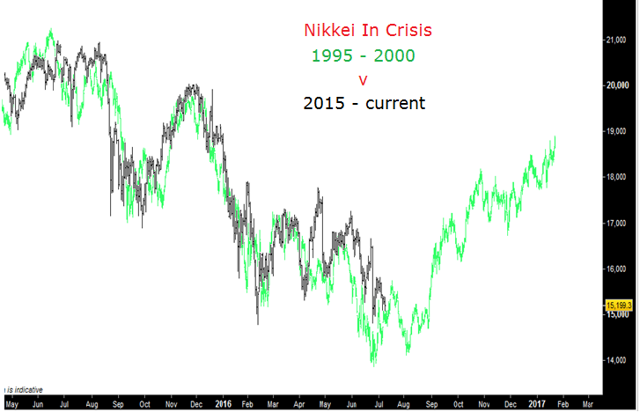 Further evidence comes from the price action of 1993-2003, a period with some similar fundamental drivers (strengthening dollar, crisis in Asia and a crash in oil). The structure of the declines has many similarities. And once the downtrend completes, there is a strong rally/short squeeze, which fades and gives way to a re-test of the lows. This is exactly what happened in 1982-1985 in the first chart. All this suggests not to get carried away in either direction. Gold is notorious for fooling the majority of retail traders; it stays in a range for most of the time and only breaks when most have given up and lost interest. Wave "C" is not expected for many years. Although silver (NYSEARCA:SLV) and gold are obviously correlated, there are both fundamental and cyclical differences. One key technical difference is the scale of the post bubble decline; 72% compared to gold's 45%. This is more in line with the classic crash as illustrated by crude oil in the 1990s. The above chart is only a rough guide, but this large flush may lead to a larger retrace than that expected in gold. Silver also has more industrial uses which could aid the recovery. A proportionate move to oil would take silver to around $40 before a further decline. 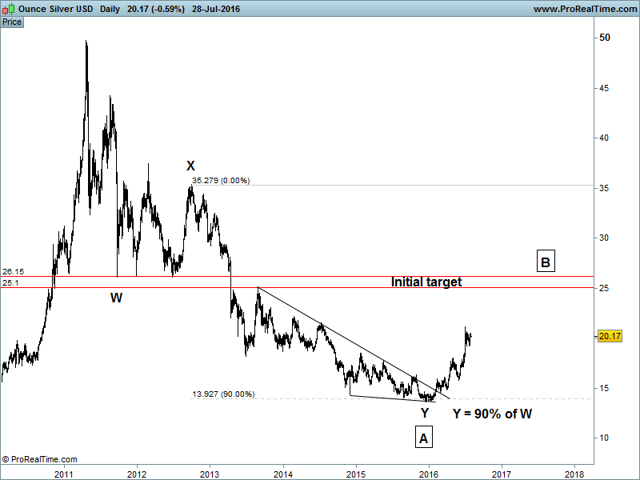 As with gold, silver has completed a common four-year bear market cycle, ending wave "A" at the 2016 low. 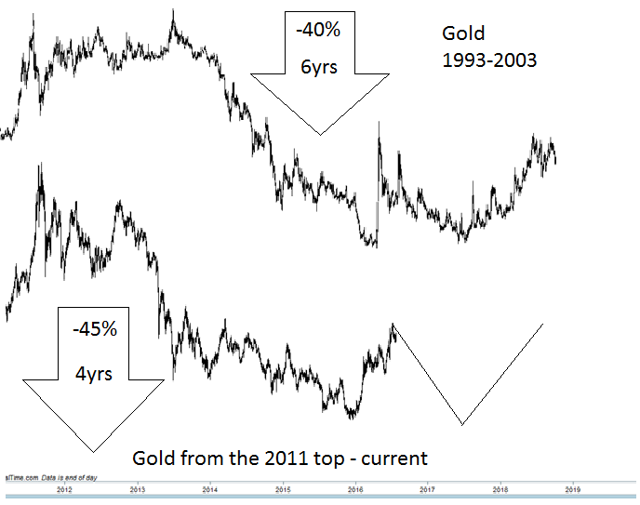 Although the decline looks quite similar to gold, there are significant and important differences. Silver's wave "A" is not impulsive; the ratios suggest the decline was in fact 3 waves and not 5. The minimum for a wave "Y" is 90% of "W", and this is exactly where price reversed. The 3 wave decline actually opens up the possibility of a new high above $50. For now, I think the odds favor a lower high, but the probabilities are constantly changing. The $40 suggested by the oil fractal is the minimum target (70%) for wave "B" if the entire ABC were to form a flat correction. Apologies for the jargon, but there's no other way to say it. In simple terms, there are a few reasons why $40 is a long-term target. The initial target is $25 as explained in an earlier article. 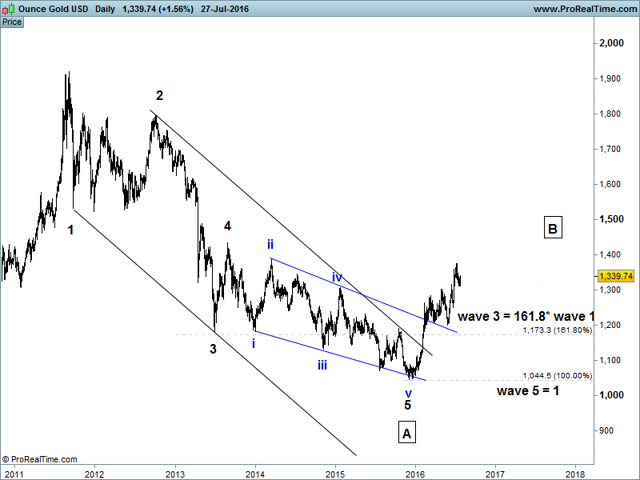 But, as with gold, the "B" wave recovery is expected to take many years before a further decline completes the correction for a wave "C". There are many twists and turns still to come during the recovery. The precious metals have completed the first leg in a very long-term decline. Both are exhibiting post bubble behavior and will likely remain in this state for a long time. Both gold and silver are now recovering in a "B" wave rally. 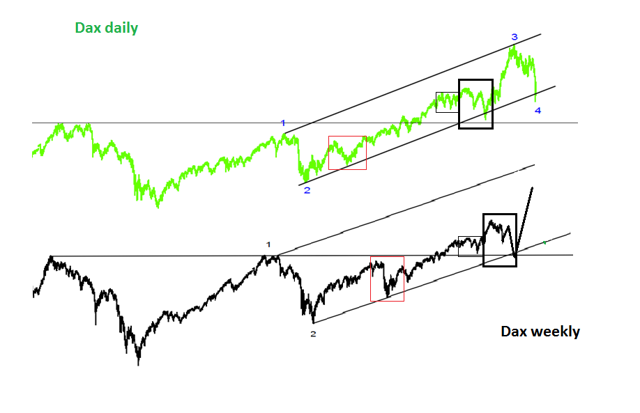 No rally is the same, but we can use fractals as a guide to expectations. I will write more on the lower time frames at a later date, but first, we need the long-term context as described above. Below is the first in the series, "Equity Cycles and Trends: A Complete Review". Nothing has changed yet from the original article, but I will update it whenever trends are likely to change. The idea is to keep adding to the work done, so eventually all the markets are reviewed in one place. The next article will focus on oil and gas. There is a major disconnect between the economies of the U.S. and the rest of the world. This is shown by the charts of stock indices: the S&P 500 is at all time highs while major indices such as the FTSE in the U.K., the German DAX, and the Nikkei in Japan are well off their highs. While the S&P 500 is still trending up, some are already retracing the first part of the downtrend. The bull market is mature as we are about half way through the last wave. 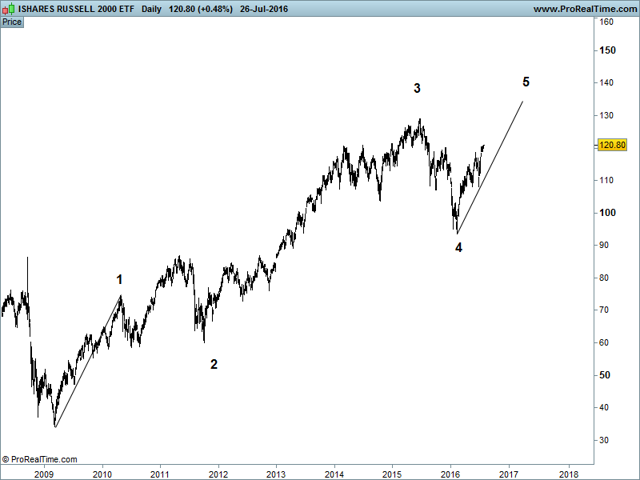 Expectation is for wave 5 to equal wave 1 in size and (sometimes) in structure. This gives a target of 2,370 for the S&P 500 when using linear measurements. The chart above actually uses logarithmic scale as it reveals very well-defined trend channels. A logarithmic measurement projects a rather improbable 3,200. How do we know it is improbable (apart from being fundamentally unlikely)? 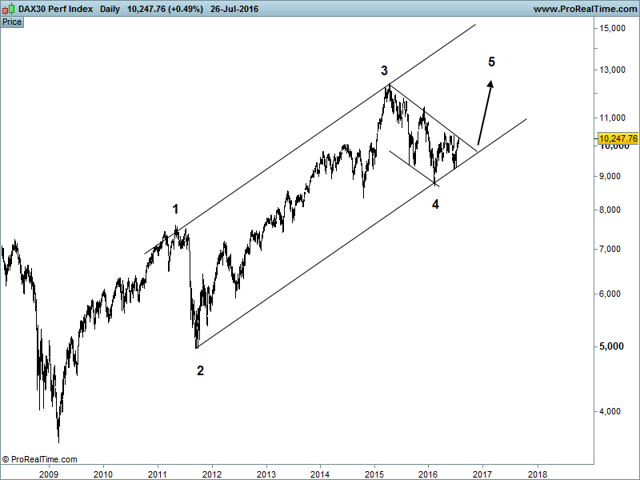 The clues are in the smaller time frames within wave 5. 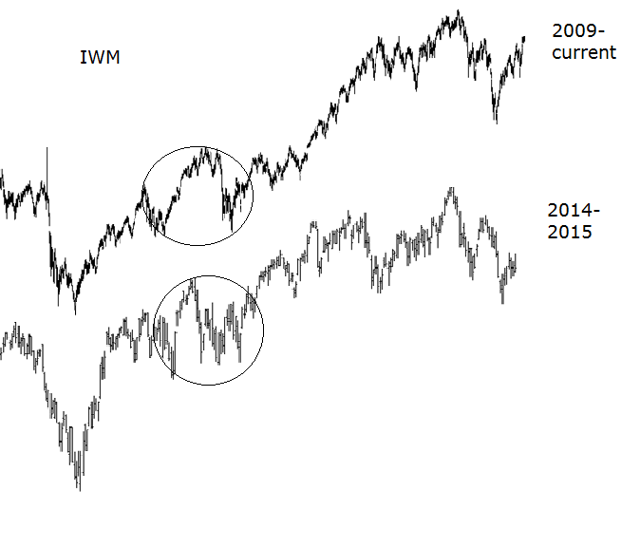 By superimposing wave 1 from the 2009 lows onto the current wave 5, we can see the similarity in structure. It suggests a slow grind into an early 2017 top, accompanied by a strange wave structure. This abnormal looking count is actually what I would expect to see: the lower time frames are not always clear, especially when a large reversal is in the making. The above map may not play out exactly, but it is the best I have at the moment. The iShares Russell 2000 ETF (NYSEARCA:IWM) has a similar structure to the SPY and to the SPDR Dow Jones Industrial Average ETF (NYSEARCA:DIA). 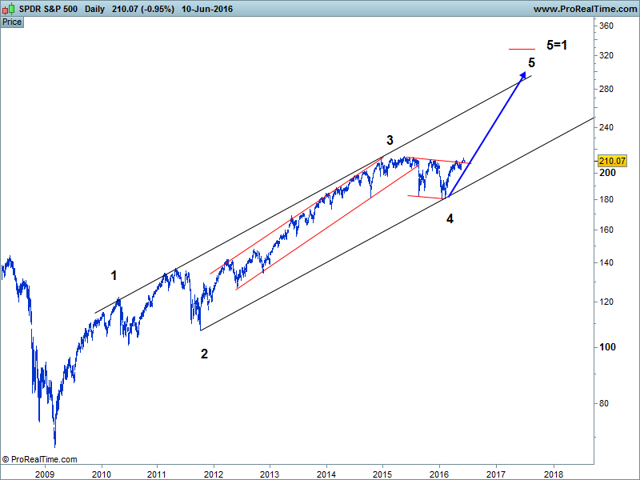 All the U.S. major indices are in wave 5, the last in the sequence. 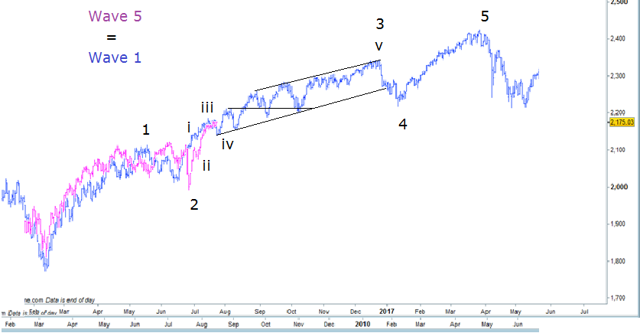 Wave 5 = 1 for IWM projects $134. The interesting thing is the structure of the wave 5 is very similar (so far) to the previous wave v from 2014 to 2015. Also compare the 2014-2015 structure to the first chart from 2009 to current. How does it rally, consolidate and correct? In the same way again! This is fractal theory: price action repeats because history and the actions of participants repeat. As I mentioned in the introduction, there is an interesting divergence between U.S. and the rest of the world. 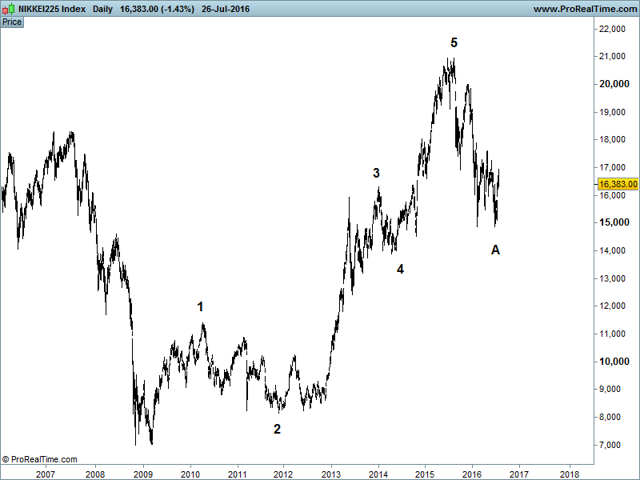 Japanese equities such as the iShares MSCI Japan ETF (NYSEARCA:EWJ) and the Nikkei 225 already topped in 2015, after completing the 5 wave bull cycle from the 2009 lows. The first leg of the downtrend completed in June as wave "A" and it should now retrace the decline by 61.8-78.6%. 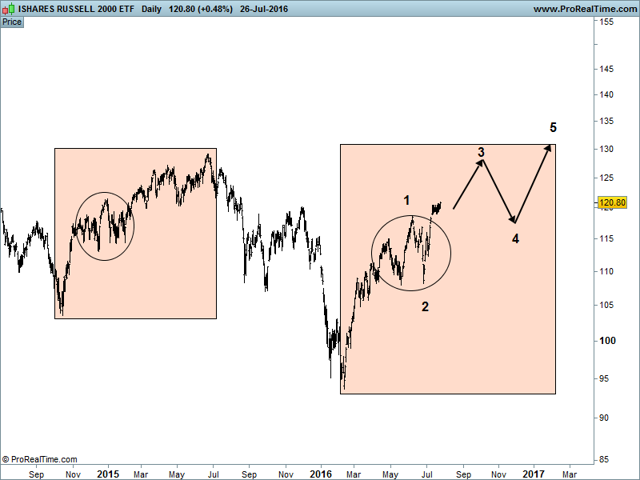 I wrote an article titled "Japanese Equities Look Ready For A 30% Rally Into 2017" in early July. The title is quite self explanatory, and one of the reasons for the call was the similarity with the Asian crisis in the 1990s. The decline in the 1990s led to a large counter-trend rally, but importantly did not make new highs and gave way to an even larger decline. This is what to expect for the Nikkei in 2017. The German DAX is also well off the 2015 highs, but is coiling to break the downtrend. There is a decent chance of a new high at some point as the February lows may have completed a large wave 4. The logarithmic chart again has the cleanest channel, but I will use the linear target for 5 = 1 which is 12,700. A new high would be consistent with the fractal I have been using as a guide for nearly a year now. It's not perfect - no fractal or repetition is - but as a longer-term guide to what is possible and probable, it has worked well so far. New highs on the DAX may seem unlikely, but don't forget the DAX rallied 32% in H1 2015 while the S&P 500 managed 7%. Further stimulus in Europe may still be necessary and a collapse in the euro currency would inflate the DAX. I will cover EURUSD and currencies at a later date, but a further move down in the euro is expected. U.S. indices are leading the way higher. Not all countries are as strong, and some, like Japan, have already started a downtrend. Rallies are likely to continue into Q1 2017, after which a large decline is expected. IMAGINE two kinds of investment funds, both of which have the same aim: to provide pensions for their employees. You might think that they would invest in a similar way. But when it comes to American pension funds, you would be wrong. It turns out that public funds have a rather different, and more aggressive, approach to risk from private ones (and indeed from their counterparts in other countries). As a recent paper* by Aleksandar Andonov, Rob Bauer and Martijn Cremers shows, that different approach is driven by a regulatory incentive—the rules that determine how pension funds calculate how much they must put aside to meet the cost of paying retirement benefits. Usually, the bulk of a pension fund’s liabilities occur well into the future, as workers retire. So that future cost has to be discounted at some rate to work out how much needs to be put aside today. Private-sector pension funds in America and elsewhere (and Canadian public funds) regard a pension promise as a kind of debt. So they use corporate-bond yields to discount future liabilities. As bond yields have fallen, so the cost of paying pensions has risen sharply. At the end of 2007, American corporate pension funds had a small surplus; by the end of last year, they had a $404 billion déficit. American public pension funds are allowed (under rules from the Government Accounting Standards Board) to discount their liabilities by the expected return on their assets. The higher the expected return, the higher the discount rate. That means, in turn, that liabilities are lower and the amount of money which the employer has to put aside today is smaller. Investing in riskier assets is thus an attractive option for a public-sector employer, which can tap only two sources of funding. It can ask its workers to contribute more, but since they are well-unionised that can lead to friction (after all, higher pension contributions amount to a pay cut). Or the employer can take the money from the public purse—either by cutting other services or by raising taxes. Neither option is politically popular. Unsurprisingly, therefore, the academics found that American public pension funds choose a riskier approach. Theory suggests that as pension funds mature (ie, more of their members are retired), they should allocate their portfolios more conservatively, because the promised benefits need to be met sooner and funds cannot risk a sudden decline in the value of their assets. That is the case with private-sector pension funds, but public funds take more risk as they mature—putting more money into equities, alternative assets (like private equity) and junk bonds. Public pension plans have also increased their allocation to risky asset classes as interest rates and bond yields have declined. Again, this does not make sense in theory. The expected return on both risk-free and risky assets should decline in tandem. But a fall in ten-year Treasury-bond yields of five percentage points has been associated with a 15-point increase in public funds’ allocation to risky assets. The academics also look at the trustees, the people who make the investment decisions. They find a relationship between the riskiness of a fund’s assets and the proportion of political trustees (such as state treasurers) and worker trustees elected by scheme members. Neither group will want to see contributions rise in the short term. So it makes sense that both groups bank on achieving higher investment returns, leaving any scheme shortfall to be cleared up later. Some people might argue that this is all for the good. Pension schemes have long-term liabilities and thus should take more risks. If public funds take more risk and earn higher returns, that is saving both their employees and taxpayers money. Alas, the academics find that, even if you allow for their asset-allocation decisions, public pension funds underperform their benchmarks by more than half a percentage point a year. This underperformance is greatest in the alternative-asset categories such as private equity. Even if their asset allocation might have beaten a bond-only portfolio, the overall strategy isn’t working. For example CalPERS, the Californian state pension fund, has underperformed its targeted 7.5% return over the past 3, 5, 10 and 20 years. The paper demonstrates convincingly that American accounting regulations have created perverse incentives for public pension funds. And that can mean only one thing. The rules need to change. The Olympics have begun in Brazil. The games were greeted by massive demonstrations by Brazilians. With Brazil facing hard economic times, many thought that spending more than $12 billion hosting the games was outrageous. The demonstrators felt there were better uses for the money. Supporters argued it would add to Brazil’s worldly luster. The Olympics of ancient Greece focused on the individual athletes. Spectators knew which city the participants came from, I assume. Still, the glory went to the athlete, and it was his tale that was told. The stories and poems of sacrifice and triumph carried the memory of the contest. That was the only way for those who were not present to know what happened. The stadiums and crowds were small, but the memories remain after 2,500 years. In the modern age, we try to remember through technology. Yet, the sheer mass of data can hide what is important. There are scant records of ancient Greece, but we remember its Olympics. Conversely, we forget things that happened a month ago. It was this collective memory of something extraordinary that caused the Olympics to be resurrected in 1896 in Athens, Greece. But there was a fundamental difference between the ancient and modern games. The athletes no longer stood alone. They were part of teams, and the teams represented nations. Since the start of the modern Olympics, the glory and the sorrow were not simply the property of the athletes, but of the nations that competed. It was cast not as a trial of men (and later women), but a competition between nations. Victory was measured by a collective count of the medals won. Nations with more medals saw themselves—and were seen—as possessing some virtue other nations lacked. The nationalization of sports changed the games profoundly. In a strange way, victory validated a nation. This is seen from 1896 onward, but it was the 1936 Berlin Olympics that definitively transformed the games into a national and ideological contest. When American track and field athlete Jesse Owens won four gold medals, Hitler left the stadium. Americans saw the victory as destroying the Nazi myth of white supremacy and a celebration of their country. Owens’ victory demonstrated the abilities of a man far more than of a nation. As a black man, Owens had a troubled and complex relationship with his country. Yet, in his victory was the story of American greatness and tolerance, not of the price Owens paid to make his way onto the American team. His story became a validation of America. We remember the 1936 Olympics and Jesse Owens as a test between Nazi Germany and the United States. The 1936 games started another dynamic. Hitler wanted the Berlin Olympics to demonstrate Germany’s ability to stage a stunning pageant. For Hitler, hosting the games was a testament to Germany’s recovery. The more impressive the games’ venues, the greater the prestige they lent Germany. This set in motion something completely alien from the original games—nations would now compete for the right to host the games. The event became a form of honor combined with conspicuous consumption. Being chosen meant that you were deemed capable of hosting a lavish event. Host countries obsess over holding ever more lavish events, but not for the sake of the games. Greek Olympians wrestled in the dirt. Now, host countries create an impressive show for the sake of national pride. It is not clear why a nation should be proud that it can stage the grandest party. Yet, it has become so. The opening and closing ceremonies have now become more important than the athletics. During these ceremonies, the nations parade and carry their flags, and the athletes are dressed in uniforms. Each nation dips its flag as it passes the host flag. When a gold medal is won, the athlete stands on a pedestal, and the national anthem is played. The victory of the athlete is the victory of the nation. All of this is amplified by technology. The Greeks couldn’t have staged such an extravaganza. Nor could it be watched live around the world. Today, there is no need for tales or poems, you can see most of it on television. Not everything, of course. There are just too many preliminaries and obscure sports. The network that buys the rights to broadcast the games must, quite reasonably, cover what the audience wants to see. Today, it is no longer possible to grasp the whole story. The event has grown staggeringly beyond a human scale. Technology can only capture and transmit so much. For most sports, only the finals are broadcast. Yet, some of the greatest individual dramas unfold during earlier trials, as the young confront the accomplished, and the guard sometimes changes in the process. Obviously, the Olympics would not exist in this form without money, and the money flows from the national networks covering the games. There is a great deal of money to be made from selling advertising time. I have absolutely no objection to making money. But it is this need to focus on the popular events that hides much of the drama from us. The Olympics are now driven by nationalism, ideology, technology, and commerce. All are legitimate, but their impact on the athletes is startling. It begins with the athletes’ training. The wealthy nations, and those who believe they will gain prestige from victory, take their best and lead them through an industrial training process. The athletes are imbued with a sense of national honor and personal possibilities that will flow from victory. Then, since most will not win a medal or even reach the finals, a private tragedy is played out. The Olympics have become precisely what the Greeks couldn’t make them… and didn’t want to. It is such a vast undertaking that the “agony of defeat”—the inner struggle referred to by the Greek term agonists—is not lost, but hidden. Most of the athletes’ stories are rarely shared with the audience. The Measure of a Nation? The Olympics have become a national rather than individual event. Hosting the event is not an act of hospitality but national pride. It must be grand, expensive, crush the city’s budget, and enrich a network. The desire to see people with great strength, when combined with a global technology, hides more than it reveals. I will never forget the 1980 “miracle on ice” at Lake Placid when the United States played the Soviet Union in hockey. A team of American amateurs took on Russia’s best and defeated them. The US had lost the Vietnam War. Inflation and unemployment were running above 10%. Mortgage rates on home loans stood at 18%. The United States was in decline, and the Soviets were invincible. Yet, we beat them in ice hockey. In reality, this thinking was insane. First, the US was not a declining nation. Second, the Soviets weren’t invincible. And finally, it was just a hockey game. It was not the measure of our nation but of the skills of the athletes. They didn’t represent us. They represented themselves. Their victory and the Soviets’ defeat said absolutely nothing about either country. It said everything about the hockey players. Technology and commerce may hide much of the Olympics, but it is nationalism and ideology that hides the most. When I recall the miracle on ice, I still glow inside and believe it was a moment of resurrection. But I honestly can’t remember the name of a single player on the American team. It is as if the athletes were merely a backdrop in my fantasy. I have lost the real meaning of the miracle, if I ever knew it. And that is what the Olympics have become.